Congressman Simeon D. Fess (R) of Ohio takes aim at some commies and a few Germans on a sunny day in 1924. For the curious collectors, here is a close-up of the ducks in the circle. 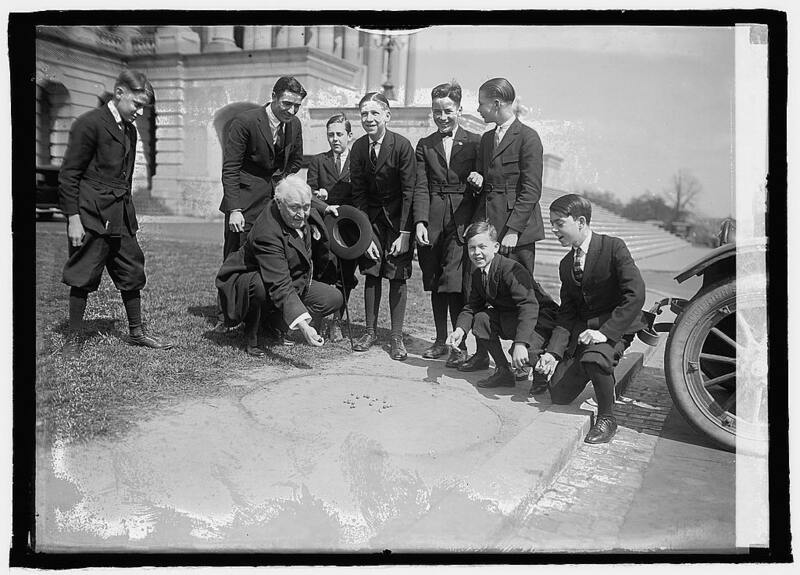 This photo, as well as one of senator Lee S. Overman playing marbles with the same group of boys, are among countless other digital treasures in the Library of Congress Prints & Photographs Online Catalog. This entry was posted on Thursday, May 9th, 2013 at 5:25 am	and is filed under marbles. You can follow any responses to this entry through the RSS 2.0 feed. You can leave a response, or trackback from your own site. 100 years ago the most expensive marble was the genuine agate, or 'realer'; it took the most labor to create and also made the best shooter due to its hardness, roundness and weight.